As some of you may (or may not) know, I sometimes pepper my Historical Fiction reviews with Sci-Fi or Fantasy. This is one of those times. I did not want Queen’s Shadow to end! 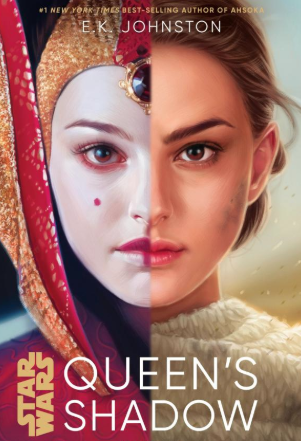 Focused on Padme Amidala between the events of Episode I and II (beginning roughly five years after EPI,) Johnston explores the character’s coming of age as she ends her tenure as Queen of Naboo and transitions to a Senator representing Naboo in the Galactic Republic. Johnston utilizes Padme’s retinue of handmaidens as a sisterhood of advisors, guards, decoys, and friends. As Senator, Padme must relinquish much of her old identity as Queen–and along with that, most of her handmaidens. While many of the handmaidens go on to pursue their own meaningful lives on Naboo, Sabe–Padme’s most trusted decoy, stays on in service to the young politician to carry out goals close to Padme’s heart. Padme also recruits two new handmaidens to her service as a Senator in Corde and Dorme, who were both seen in Episode II. Padme Amidala’s fashion in the prequels is hard to forget thanks to the brilliantly creative costume designer Trisha Biggar, and Johnston not only uses these recognizable outfits, but creates new ones, each with their own practical uses which are not obvious to the naked eye. For example, a type of blaster-proof fabric, light reflectors for photos on the HoloNet, etc. Even makeup and hair tools have their own importance to Padme and her handmaidens. Padme was a major inspiration and role model for me as a pre-teen and teen, and Johnston makes me love her more by reinforcing her complexity, intelligence, and determination. While Padme can hold her own in a battle or tough situations, Johnston also does not exchange “feminine” for “masculine”. On the contrary, she highlights that Padme and her handmaidens embody both traits, as objects of traditional femininity are often used to distract or protect from those who would underestimate this group of talented young women. Padme also works hard to build a new identity for herself as Senator, but must also learn to at times stand on her own two feet–without her handmaidens. In turn, the retinue themselves must learn to know how to live a life no longer in service to the former Queen.